Oxford English Academy (OEA), based in Oxford, the United Kingdom is a city known worldwide for its vibrant history and culture. OEA has expanded its international network of English language schools to various countries in the world. With the teaching experience and expertise in ESL service, OEA provides a complete learning experience combined with well researched and developed teaching programs, and thoroughly selective textbooks. OEA international network of English language schools all gain a competitive edge from centralized and networked support, providing them with the benefit of ongoing development and continual strengthening of the brand – Oxford English Academy (UK). OEA, through its well-established brand, has been making unceasing efforts to take “Britishness” to various countries all over the world. OEA Vietnam, managed by BrainClick Vietnam, strictly follows academic procedures and quality standards regulated by OEA UK and the UK Education System. OEA Vietnam is the Authorised Regional Representative of OEA (UK) carrying out exclusive right to develop and manage network of OEA schools in Vietnam. OEA Vietnam is a strategic partner of Oxford University Press (OUP) in Vietnam. As a strategic partner, all the textbooks and teaching materials used by OEA Vietnam are under special consultation from Oxford University Press (OUP). 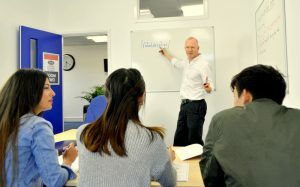 We pride ourselves on being not only a reputable English language traning school Hanoi, a prestigious Authorised Cambridge English Exams Centre nothern Vietnam but being recognized as a high expertise school also, actively making contribution to the development of English language teaching and learning in the community. OEA Vietnam was awarded “The Centre of Best Customer Support” by Cambrige English Language Assessment in the 100th Anniversary Cambridge English in Vietnam 2013. OEA Vietnam – the only language school was invited to participate in the National University Exams Preparation and Consultation 2010 Program hosted by Vietnam Television (VTV2): It is a TV show on helping University candidates prepare for their national university entrance exams in English language. Live on VTV2 provide solutions to University English exams in the year 2011, 2012, 2013 and 2014. Provide TV-based teacher training program on “Applying CEFR for English Learning, Teaching and Assessment” in support for the National Scheme on Foreign Language Teaching and Learning 2020. Professional training workshops for Cambridge English exams speaking examiners: YLE, KET/PET, FCE, CAE và BULATS. OEA Vietnam was selected to provide English language and the U.S culture program for the English Access Microscholarship Program which is a global high-profile scholarship program sponsored by the U.S. Department of State, and the U.S Embassy Hanoi Vietnam in the year 2011-2012 (Hai Duong), 2013-2014 (Hung Yen) and 2014-2015 (Bac Ninh). The participants are 75 economically, socially or ethnically disadvantaged students (aged from 14-18) that have good academic records in Hai Duong province and Hung Yen province. The program gives participants the opportunity to gain an appreciation for U.S. culture and values, and is intended to increase their ability to participate successfully in the socio-economic development of the country, and improve their chances of participating in U.S. educational and exchange programs. Our English training programs are based on the latest researches and theories on Teaching English to Speakers of Other Languages (TESOL) and Teaching English as a Forein Language (TEFL), and that are in alignment with the most current Vietnamese and international policies on applying the Common European Framework of Reference of Languages (CEFR) and Foreign Language Profiency Framework for Vietnam promulgated in 2014. OEA FastMovers (OFM) is a “personalized English learning” courses tailored for individuals of different levels and learning needs. OEA Vietnam offers various English language programs, under special consultation from Oxford University Press (OUP) – OEA’s strategic partner, tailored in accordance with the organization’s learning needs. OEA Vietnam understands that the prime factor for a successful course is the training need analysis (TNA). Our experienced and professional corporate training counselors will identify and analyze your organization’s learning needs. OEA Vietnam uses only highly qualified, experienced, dedicated and professional native teachers (combined with bilingual teachers if needed) to provide effective and practical learning solutions for both corporate and individual English needs at different ages and levels. OEA Vietnam is pleased to provide the teacher CV before the course opening date. As a major difference, OEA UK (Head office) reserves the right to appoint Directors of Studies for worldwide member schools in order to ensure academic management & quality control regulated by the head office.